3herosoft PDF to EPUB Converter for Mac - The best PDF to EPUB Converter to convert PDF to EPUB on Mac. Compare to PDF format, ePub will be well compatible with a wides range of eBooks readers. For iPad, it can perfectly support ePub eBooks, for iBooks application uses the ePub format. 3herosoft PDF to ePub Converter for Mac is an intuitive and powerful PDF solution program, which enables you to read ePub from PDF files on mobile readers in a breeze. After convert PDF to ePub, Mac users can transfer ePub ebooks to iPad/iPad 2/new iPad/iPhone/iPod touch, Sony Reader, Barnes@Noble nook, Hanlin eReader, etc. for fantastic reading experience. As the best customer-oriented PDF to ePub for Mac , Mac PDF to EPUB Converter provides powerful setting functions such as converting several PDF documents at one time, customize the output page to be converted, specify output folder, personalize the EPUB eBook, etc. PDF to ePub for Mac can retain the original text, layouts, images, and hyperlinks in the output EPUB eBooks. PDF to ePub Converter for Mac tool provides 2 options to customize the output EPUB eBooks. 3herosoft PDF to ePub Converter for Mac also allow you to customize detailed info for ePub books, such as crop and trim PDF page for output certain images, modify books Name, Description, Category, Cover, etc. Free download this Mac PDF to ePub Converter and get ePub files from PDF, and you can transfer ePub into mobile reader to enjoy the books wherever you go! 3herosoft PDF to EPUB Converter for Mac allows you to easily convert PDF files to EPUB files, so you can view them on any eBook readers compatible with EPUB. 3herosoft PDF to EPUB Converter for Mac is a standalone program for PDF to EPUB. It does not need Adobe Acrobat or other third-party controls support. 3herosoft PDF to EPUB Converter for Mac can convert PDF pages with text or picture mode to EPUB. Multithreading and batch conversion provide super fast PDF to EPUB conversion speed due to multi-core CPU support. Faster than any other PDF to EPUB conversion software. At times you need to convert only selected pages of your document. In this scenario, you don’t need to convert the complete document. 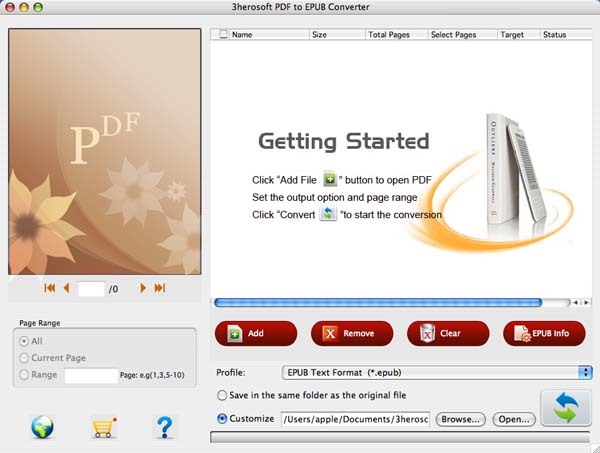 3herosoft PDF to EPUB Converter for Mac allows partial document conversion. Specify the pages or page range for conversion and the tool will convert the document accordingly. 3herosoft PDF to EPUB Converter for Mac can convert PDFs generated through any application into EPUB. This makes this tool quite versatile. How to convert PDF to ePub files on Mac? How to Edit ePub info/pictures on Mac?